I hope the summer is treating you well and that life is good. As you will all know, we have had some troubling times here in the UK and I am about to leave my home now to go where there is real deprivation, real need and very probably real reasons for protest. I suppose the real pre-occupation of the majority of people we are trying to help is having enough food to eat and the search for gainful employment. Nowhere is everything bad and at this moment there are six remarkable volunteers in Kigali, most of them giving up their holidays to help us. I am very much looking forward to meeting Niall and Hannah soon. Marian and Nicola will be back in the UK before I reach Africa, but I say thank you very much for what you have been doing for us – there will be much more about them on our website when we add information about our 2011 activities. What is more, I am thrilled to be able to say a huge ‘thank you’ to all the groups and individuals who have given very generously over the summer – so much so that we are preparing to transfer enough funds to finish the building work. I think it will be finished over the next six months and will keep you posted. Again, more information will be posted in our 2011 update. And grateful thanks to my family for putting up with me and my demands and who help so much in so many ways – also to all the people in my locality, friend, neighbours, school children and teachers who have made my own fundraising in the last five month very worthwhile. Thank you also for all the wonderful donations for the next container load, scheduled to go out to Rwanda soon, courtesy of NPAC and my wonderful friend Jules and her fab team. 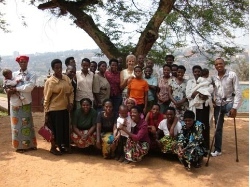 This is a picture of some of the parents of children we are sponsoring at primary school, plus a couple of our teachers. They are very grateful for this opportunity for their children, an opportunity which most of them has been denied. We are very slowly building up the number of sponsors, a hugely important source of sustainable income for us, something which will guarantee out long-term future. Thank you for supporting us and telling your friends about us! Briefly, and finally, I noticed last time I was in Rwanda many more of the children were beginning to engage more often in imaginative play and in both small and large groups. These few photographs should bring smiles I think. (I am so looking forward to those smiles and hugs) The pictures show the children at play, at a wedding, greeting visitors, on the phone and at home-time.